Our regular comics coverage has been nearly overrun with DC Comics' New 52, which is the dominant thing in the world of American comics right now. DC, the publisher of Superman, Batman and Ambush Bug, is rolling out 51 new first issues this month (plus one last month). They're starting (or re-starting) a ton of books and stories. There are only 13 new DC books still to be launched this month. One of them is next week's Blackhawks, a thorough re-think of the classic Quality and DC Comics series about World War II fighter pilots. The new version isn't retro. Our new Blackhawks appear to be a modern paramilitary team. 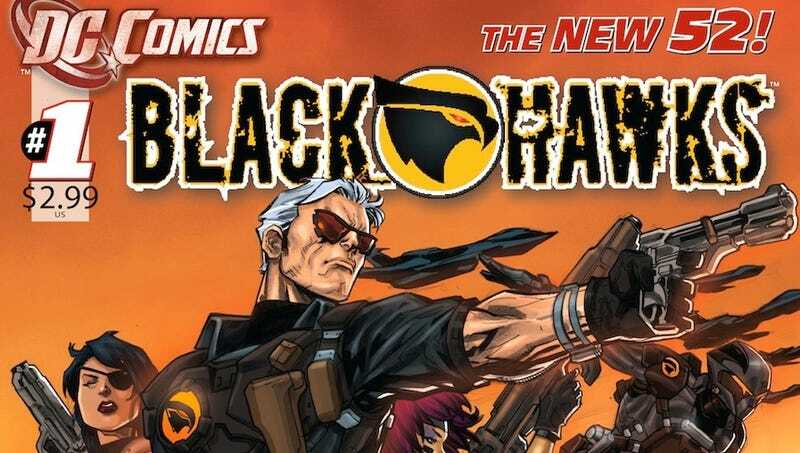 DC has given Kotaku an exclusive look at the first four pages of the new high-tech version of Blackhawk. Enjoy. The writer is Mike Costa (G.I Joe). The artists are Ken Lashley and Graham Nolan. Click each page for a larger version.